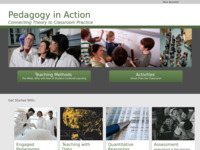 Pedagogy in Action -This site provides an introduction to a range of effective teaching methods that go beyond lecture. The site describes the methods, points to the research about its effectiveness, provides hints and tips for using it well and ends with a collection of classroom activities that exemplify the teaching methods. 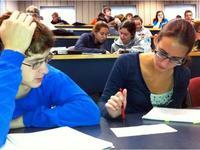 There are also subsets of this site focused on geoscience-specific teaching methods and activities. Integrating Research and Education - Resources For Educators - Browse geoscience instructional materials that link scientific content to teaching activities. Instructional modules focus on three themes: Earth System Science, Diversity in the Geosciences (first nations and the geosciences), and Using Geoscience Instrumentation, Databases and the New Cyberinfrastructure. These instructional modules include thematic collections of resources on topics of interest, tutorials on how to access geoscience databases, and examples of how digital libraries can be used to aggregate community resources and more. Classroom Observation Project (RTOP) - From On the Cuttinng Edge, this research project involves observing geoscience teaching in college classrooms across the U.S., and makes use of the Reformed Teaching Observation Protocol (RTOP) to gauge where classes fall on a spectrum from instructor- to student-centered and identify areas where active, engaged learning practices can be added or improved. The website provides tips and advice for making your class more student-centered, and faculty can participate in the data collection effort by observing geoscience courses taught by others and/or by having their own classes observed. 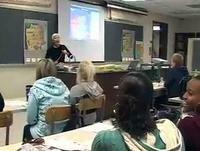 Effective Strategies for Undergraduate Geoscience Teaching - From On the Cutting Edge, this series of webinars offers resources for and insights into effective teaching and that incorporate active learning and are designed to provide educators with concrete examples of activities and teaching strategies they can use in the classroom. 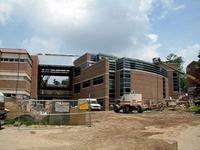 Topics include: jigsaws, designing labs that promote inquiry, concept sketches, and ConcepTests. Recordings of each webinar and related links are included on each event web page. 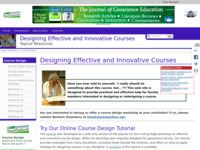 Course Design Tutorial - This tutorial was developed as a web-only version of the popular On the Cutting Edge workshop on effective and innovative course design. While the workshop was originally designed for geoscience faculty, the tutorial provides examples from many disciplines, including those outside the sciences, and offers an easy-to-apply strategy for designing courses that incorporate effective teaching methods in any discipline. A synopsis of the tutorial is also available. Designing Courses. 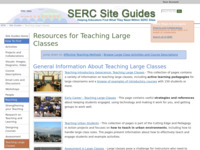 This site guide provides pointers to resources to help in developing, or revamping your courses. These include the popular Course Design tutorial and other resources for particular course types. Research on Teaching and Learning. 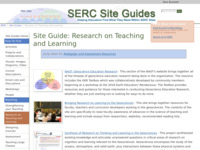 This site guide provides pointers to resources that explore research on teaching and learning, including collaborations with the cognitive science community. Assessment. 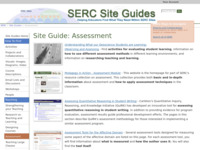 This site guide provides pointers to resources that you can use to assess your students, courses, and programs or departments. Teaching with Current Research and Data. 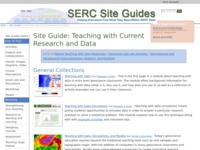 This site guide provides pointers to SERC sites that contain teaching method pedagodies and activities that incorporate datasets and current research and data into the classroom. Teaching Large Classes. 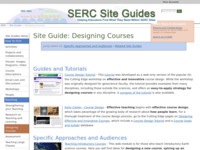 This site guide provides resources that are useful in designing and teaching large courses. Quantitative Skills, Thinking, and Reasoning. This site guide provides pointers to resources to incorporate quantitative skills, thinking, and reasoning into your classroom. Teaching in the Field. 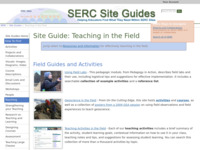 This site guide provides pointers to resources that contain information about teaching in the field. 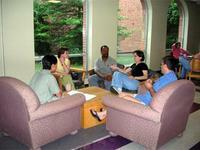 Resources for Teaching Introductory Level Courses. 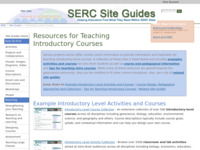 This site guide provides pointers that contain useful information and inspiration for teaching introductory-level courses. While many of these resources are geared towards the geoscience community, they can be modified to fit other science disciplines. 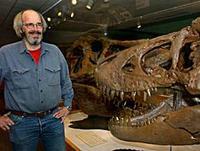 Resources for Teaching Upper Level Geoscience Courses. 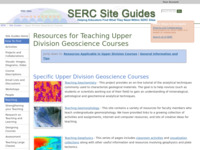 This site guide provides pointers including activities, course information, and teaching methods that can be utilized in upper-level courses in the geosciences. Early Career - Geoscience - If you're just beginning (or about to begin) a career as a geoscience faculty member, you're probably wondering how to balance teaching, research, and other demands on your time, so that you can succeed without having to sacrifice your sanity. In fact, finding that balance may be the most important skill for you to master, to be successful in academia. Fortunately, you do not need to reinvent the wheel. This page is a gateway to resources you can use to maximize your efficiency with a minimum of stress. Career Preparation - We have an annual workshop and an associated set of web resources for graduate students and post-docs who are preparing for an academic career in the geosciences. These resources focus on key topics of interest, including the academic job search process, preparing to teach, and moving your research forward. Career Development - We have annual events, including workshops and webinars as well as an associated set of web resources for graduate students and post-docs who are preparing for an academic career in the geosciences. 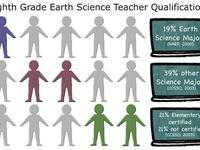 Preparing Teachers to Teach Earth Science - This site examines the role of geoscience departments and faculty in preparing preservice teachers and supporting practicing teachers who teach Earth science at all pre-college levels. Information is drawn from the participants and outcomes of the 2003 On the Cutting Edge workshop, Developing the Earth Science Teacher Workforce: The Role of Geoscience Departments and Introductory Courses.